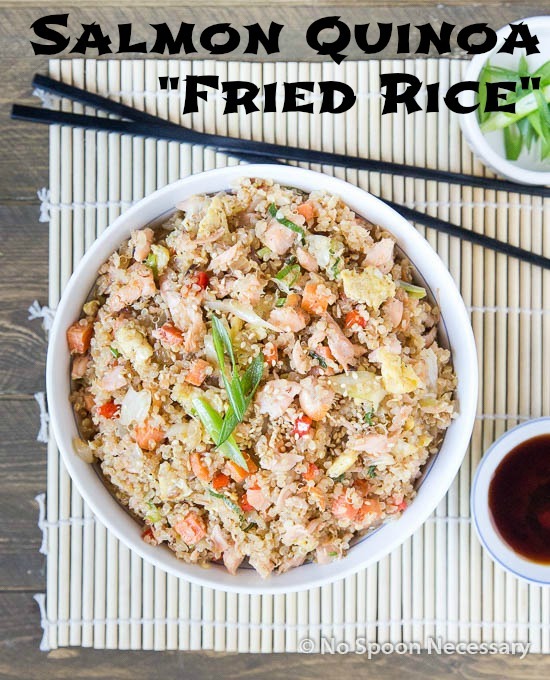 Quinoa “fried rice” is a healthy and delicious alternative to traditional fried rice. 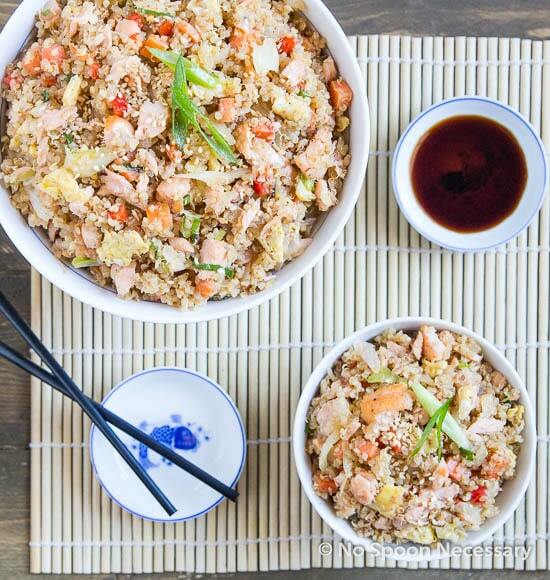 The addition of salmon makes this a well rounded, seriously scrumptious, quick and easy meal! But, feel free to substitute whatever leftover protein you have hanging out in your refrigerator. Boy and I were talking randomly about our childhood, and how growing up now is so different from what we experienced. As a product of the 80’s, I have a special place in my heart for acid washed jeans, tie die t-shirts, hair crimping, slap bracelets, and the such. But, I don’t care how attractive you are, most of the styles from the 80’s are not a good look on anyone. The 80’s was the age before the digital era. Before twitter, reality TV, text messages and match.com took over the world. Face to face interaction wasn’t a thing of the past. Growing up we had laser tag, arcades, roller skating rinks, moon boots, slip n slide, play dough, sprinklers in the front yard… okay, so some of that still exists. But, children today seem to fancy the finer gadgets, like the Wii. Boy and I can’t have children (the non-furry type) of our own. If we could, and did, I often wonder ‘what the heck would we do with them? ?’ Do you simply hand them a cell phone and tablet once they reach the ripe age of being capable of grasping objects? Anyways, growing up I do not recall my parents preparing a lot of dishes with salmon. We certainly never ate quinoa. When I was younger, I was an extremely picky eater… which lead to the whole pescatarian thing later in life. 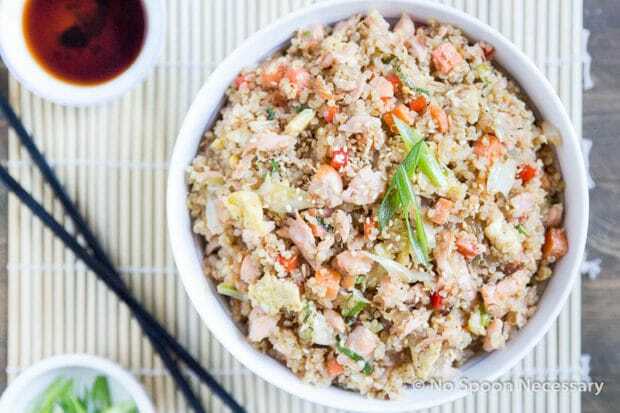 I’d like to think if my mother made more dishes like this- Salmon and Quinoa ‘Fried Rice’– I would have happily devoured them. And possibly started eating more adventurously at an earlier age. 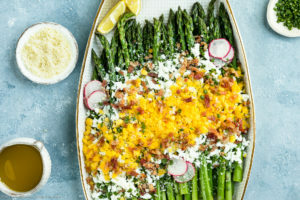 This dish is my new favorite way to utilize leftovers. That’s saying a lot, because operating and cooking for a food blog leaves you with a TON of leftovers. 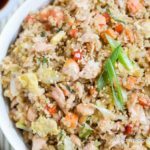 The culinary inspiration behind this dish came from having leftover cooked salmon, quinoa, cabbage and veggies that needed to be used in the fridge. 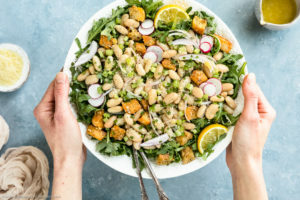 I honestly wasn’t planning on blogging about it, but it turned out so delicious I decided I absolutely had to make it a few more times, to perfect the recipe, and share it with you guys. 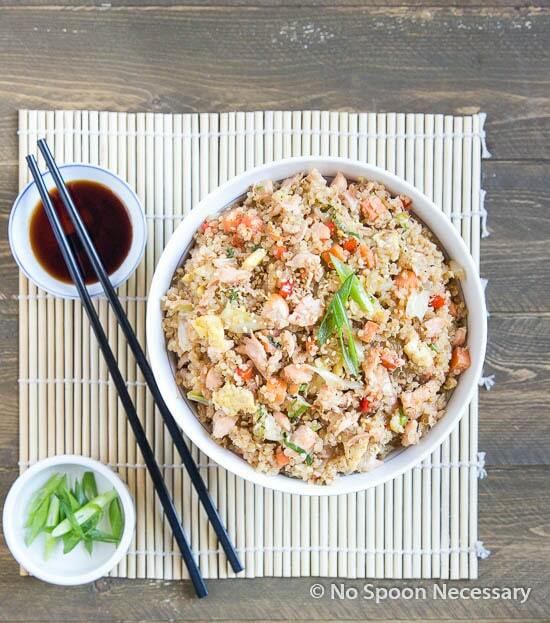 Salmon and Quinoa ‘Fried Rice’ definitely needs to be added to your weekly meal plan rotation. 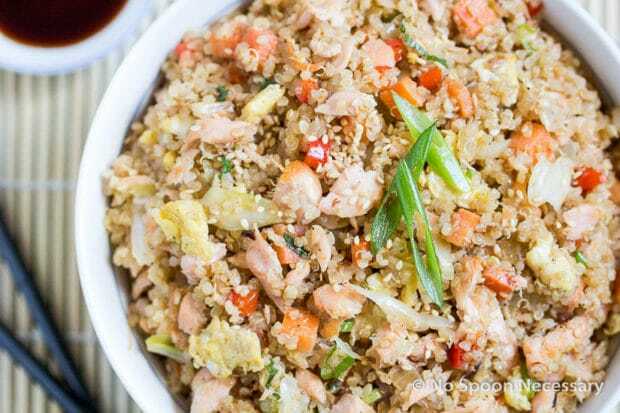 Simply substitute the salmon for whatever cooked protein you’ve got leftover in the fridge, and you will have a healthy and scrumptious meal ready in a matter of minutes. 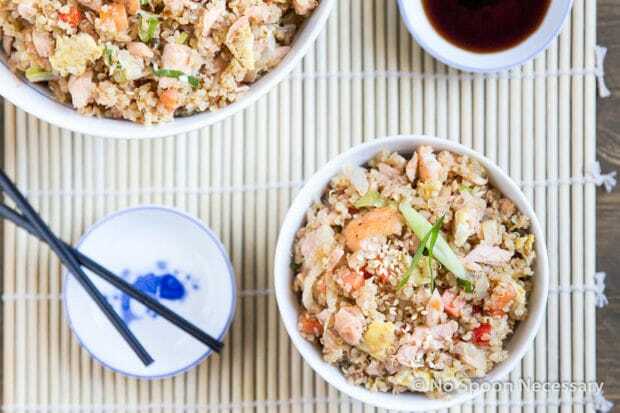 Quinoa "fried rice" is a healthy and delicious alternative to traditional fried rice. 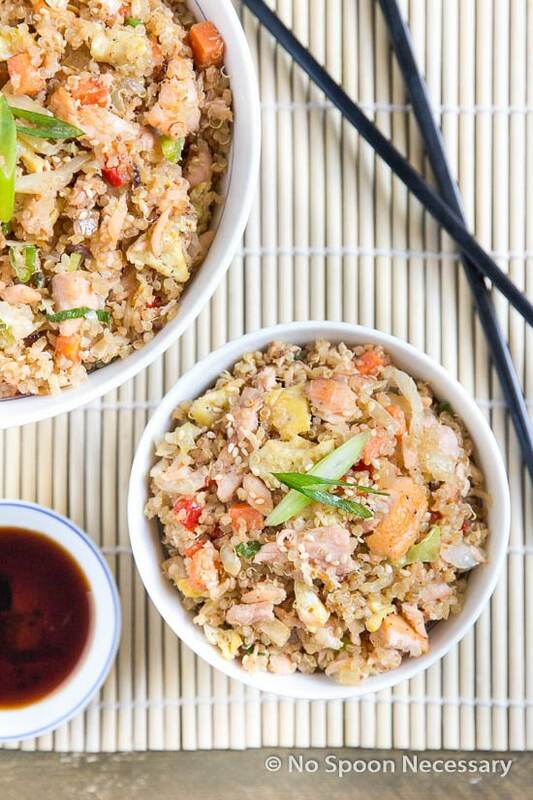 The addition of salmon makes this a well rounded, seriously scrumptious, quick and easy meal! But, feel free to substitute whatever leftover protein you have hanging out in your refrigerator. Heat 2 tsp oil in a skillet over medium heat. Add the eggs and season with salt and pepper. Cook and scramble eggs, breaking them up with the edge of a wooden spatula, until almost cooked through, about 2 minutes. Transfer to a plate and set aside. Mix the liquid ingredients for the sauce in a small bowl and set aside. Heat 1 tablespoon oil in a large skillet, or wok, over medium high heat. Add the onion, carrot and red bell pepper. Season with measured salt and pepper. Cook, stirring, for 3-4 minutes, or until vegetables are softened. 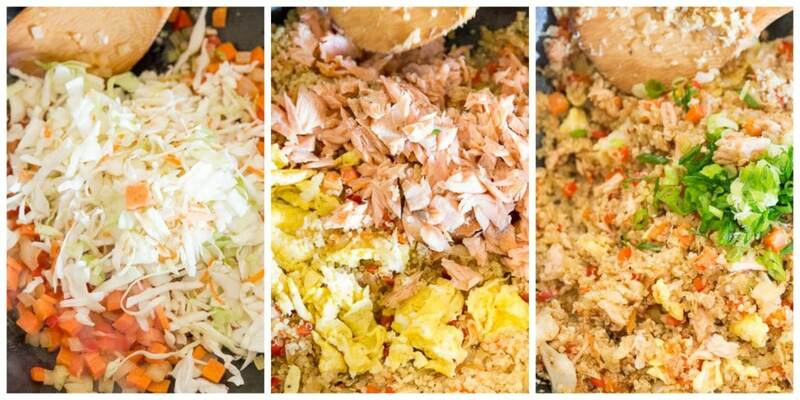 Add the cabbage and remaining 1 tablespoon of oil and continue to cook, stirring, until vegetables beginning to brown, 3-4 minutes. Add the garlic and ginger and cook until fragrant, 30 seconds – 1 minute. Add the cooked quinoa and continue to cook, stirring constantly, until heated through, about 2 minutes. Add mixed sauce ingredients, stir to combine. 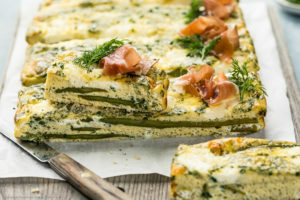 Add the cooked eggs and salmon. Stir to combine. Taste and adjust for seasoning. 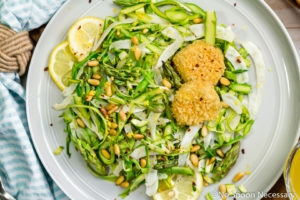 Stir in scallions and serve immediately. 1. In a fine mesh strainer rinse quinoa with cold water. 2. 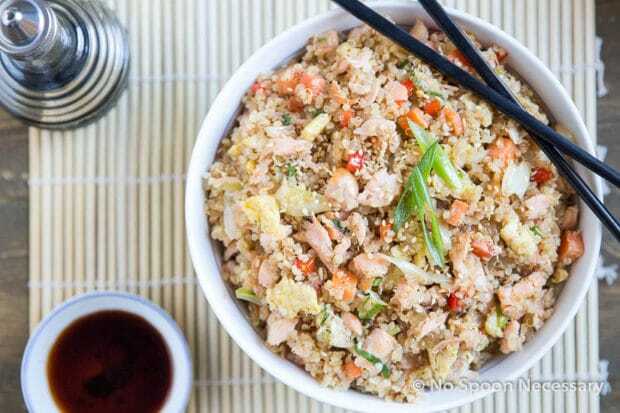 In a medium saucepan, combine 1 cup of quinoa, ¼ tsp salt and 1 ¼ cup of boiling water. 3. Simmer quinoa, covered, for 12 minutes over low- medium low heat. Remove pan from heat and allow to stand, covered, for 5 minutes. 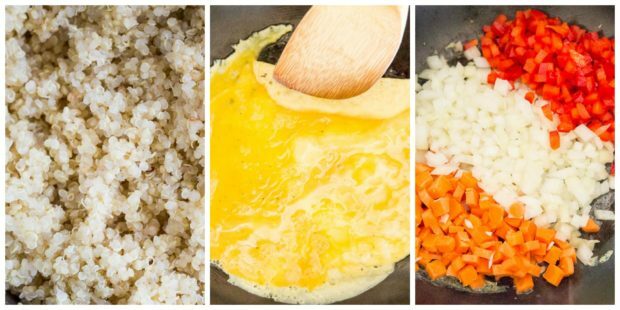 Remove cover and gently fluff the quinoa with a fork. 4. 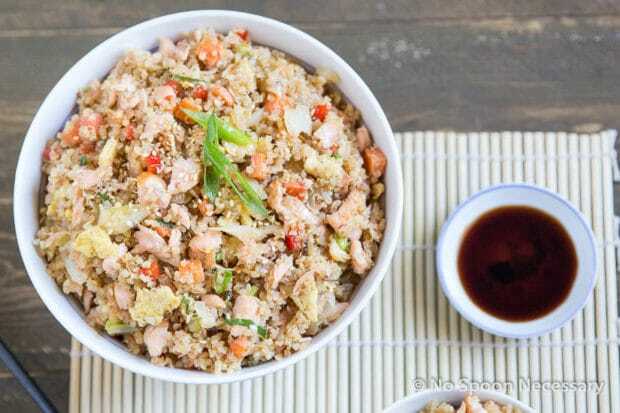 Set the quinoa aside and allow to cool, on the counter, to room temperature. 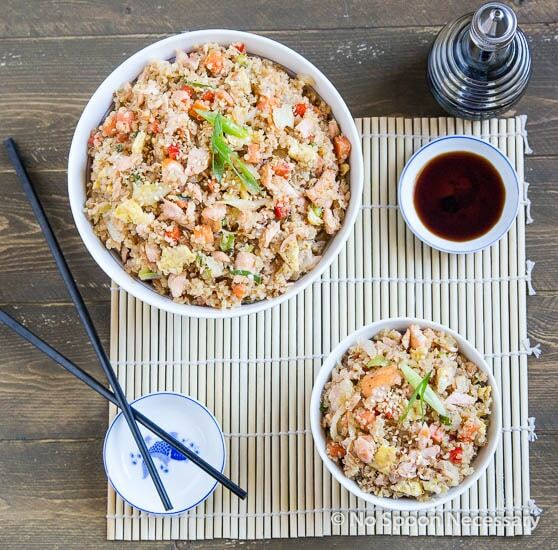 Transfer to a container, cover and refrigerate at least 4 hours, preferably overnight before proceeding with recipe. Oh wow, Chey- this was amazing! I made it for dinner tonight. Love the Flavor conbo. It was so delish! We will be making this plenty of tunes in the future! Cooked this for dinner tonight and it went over really well! I added some peas (leftovers) and skipped the sesame seeds as we didn’t have any. Yum yum! 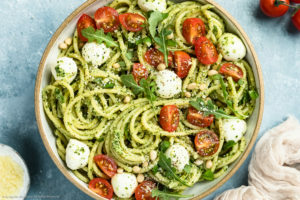 Thanks for sharing such a great recipe online! We were just talking about how we need to eat more salmon, and this is the perfect idea for it! Hey Matt, Salmon is something I love and always seem to forget about momentarily… until I make something like this with leftovers. 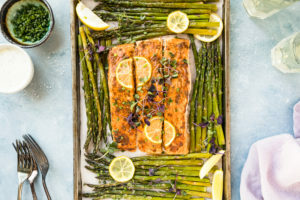 Then I go on a salmon bender for a few weeks 🙂 Thanks for stopping by and commenting. Hope you and your family have a wonderful weekend!